The good news is, what looked preseason like it might be a bit of a Friday night stinker, suddenly shapes as a pretty interesting match-up. 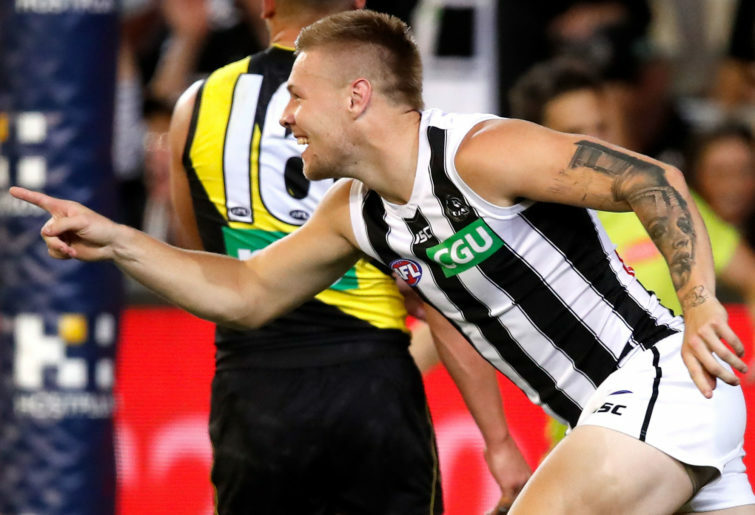 The Pies are hot favourites, despite having dropped two of their first three games – in their defence, the Cats and Eagles might just be the teams to beat this season. The Bulldogs are coming off their first loss of the season and a strong performance tonight would give them a world of confidence. Most Dogs fans would have been delighted if you told them their side would start 2-1, though they might have furrowed their brow if you’d suggested their first loss would come against the Suns. These sides last met in Round 10 last season at Docklands. The former Footscray jumped out of the blocks, kicking five of the game’s six first-quarter goals, and even held a three-goal halftime advantage before Collingwood put their foot down and kicked eight goals to none after the main break to run away 35-point winners. Brodie Grundy dominated that Friday night, finishing with 26 disposals, seven clearances and two Brownlow votes. Adam Treloar was the main beneficiary of Grundy’s dominance, earning the umpires’ three votes thanks to 40 disposals and two goals, while Tom Phillips (36 disposals), Scott Pendlebury (32) and Jack Crisp (32) all racked up touches as well. The Dogs looked to three big men to challenge Grundy that night, but none of Tom Boyd, Jackson Trengove or now-Magpie Jordan Roughead were up to the task. Tonight the responsibility will be on promising but raw 21-year-old Tim English, with some relief from fellow 21-year-old Josh Schache. It appears a task too great for English, so it’ll be up to the Bulldogs’ midfielders to give him all the support they can to keep their team in the contest. The Pies’ midfield power is well known. In Grundy, Pendlebury, Treloar, Phillips, Steele Sidebottom, Taylor Adams and Dayne Beams, they boast a group that is the envy of most of the league. The Bulldogs are no slouches in that area. Marcus Bontempelli and Jack Macrae form a one-two punch as good as just about any, and Tom Liberatore has returned from his second knee reconstruction in exceptional touch. Lachie Hunter, Toby McLean (used mostly as a forward this season), Mitch Wallis and Josh Dunkley form a deep and capable collection of ball-winners. They can’t afford any passengers tonight. Collingwood’s midfield might be packed full of stars, but the one who shines brightest lurks in their attacking third. Jordan de Goey has picked up right where he left off after last year’s finals series. He has ten goals in three games this season and the Dogs don’t have an obvious match-up for him – to be fair to them, few teams do. Hayden Crozier could get first crack, or perhaps skipper Easton Wood, though the premiership captain probably lacks the athleticism these days to match De Goey in either the air or on the ground. De Goey has good company up front. Mason Cox will provide headaches in the air, while Jaidyn Stephenson, Josh Thomas and Jamie Elliott all play taller than their size suggests without giving much – if anything – away when the ball hits the deck. Diminutive Dog Caleb Daniel’s smart and skilful ball use makes him a crucial cog in his side’s transition game, but there’s nowhere for him to hide tonight when it’s time to defend. If the supply is good and regular, Collingwood should keep the scoreboard ticking over. At the other end, the Bulldogs’ attack is a lot of potential but has at least as many questions as answers when it comes to what it will deliver week to week in 2019. Aaron Naughton is as exciting as any young key-position player in the competition, but he’s still a bit of an unknown as a forward. Darcy Moore is one of the few players in the league who can match Naughton’s aerial prowess. Every Billy Gowers moment of brilliance is matched by a head-scratching blunder, Schache still fades out of games too often and milestone man Tory Dickson’s best days are behind him. McLean and Dunkley are midfielders masquerading as forwards. Collingwood’s back six is without doubt their weakest third, but there’s nothing for them to fear here. Both sides have made one change after their Round 3 defeats. Jason Johannisen returns for the Dogs at the expense of young key defender Lewis Young, which leaves Zaine Cordy as their only true key defender as long as Naughton anchors the attack. Johannisen will provide much-needed line-breaking run for the Dogs, who too often bogged down against the Suns’ zone last week. For the Pies, Travis Varcoe is back in the side after a week out of the seniors, while tagger Levi Greenwood has been dropped. 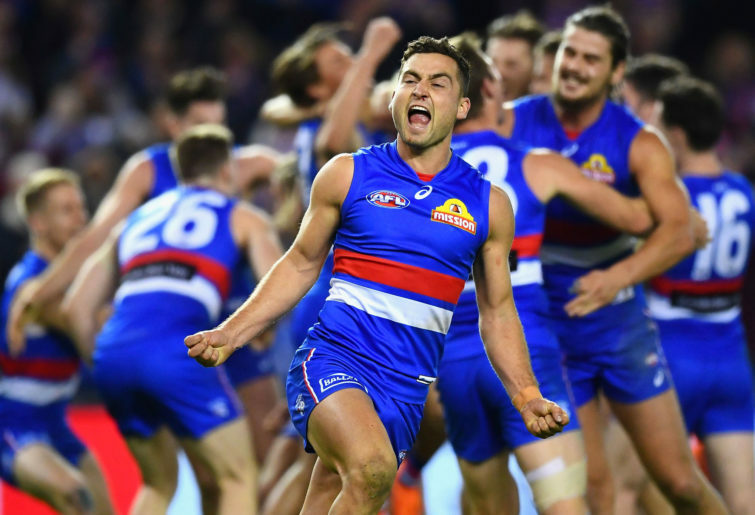 The Bulldogs aren’t without a puncher’s chance tonight, but they’re fighting out of their weight class against a team with realistic premiership aspirations. That’s my Friday night forecast. What’s yours?